"You won't need to buy anything special to make these muffins. They're easy, sweet and fruity!" Preheat oven to 400 degrees F (200 degrees C). Lightly grease 12 muffin cups. Combine raisin bran cereal and milk. Let stand until mixture is moistened. Beat in egg and shortening. Mix in flour, baking powder, salt and sugar, stirring only until combined. Fill greased muffin pans 2/3 full. Bake in preheated oven for 30 minutes, until toothpick inserted into center of a muffin comes out clean. 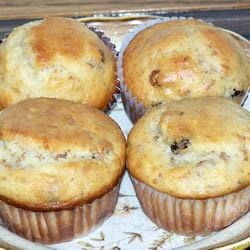 These muffins are so moist and flavorful, you won't believe they're healthy, too! Nice and moist, but not very sweet. I think they were a bit too salty, too. i also added walnuts and used a combination of half oil and half water (instead of just the oil). it still came out well. This recipe is super easy, and really good. I was surprise at how moist my muffins turned out. I substituted apple sauce for the oil to make them even healthier. Still just as great! Best at 375 for 14 Min. Great light 8 muffins. Used 1/2 AP Four and 1/2 wheat. Will probably add the banana others suggested next time. I was very unpleased, it says to bake for 30min. After 20 min. my muffins were burnt!! Not bad but nothing special.